Product prices and availability are accurate as of 2019-04-14 20:35:01 EDT and are subject to change. Any price and availability information displayed on http://www.amazon.com/ at the time of purchase will apply to the purchase of this product. 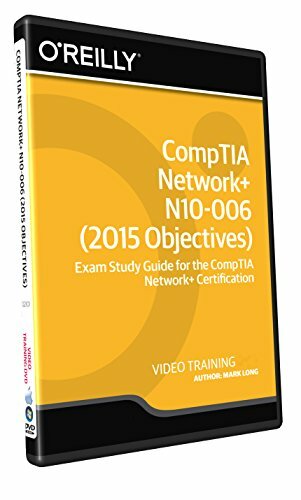 In this CompTIA Network+ N10-006 (2015 Objectives) training course, expert author Mark Long teaches you everything you need to know to prepare for the CompTIA N10-006 Network+ Certification Exam. This course is designed for those looking to achieve the CompTIA Network+ Certification. You will start by learning networking basics, including the OSI model, hexadecimal numbers, and modulation. From there, Mark will teach you about network types and devices, such as routers, models, and firewalls. This video tutorial also covers topics including cabling and connections, WAN technologies, network addressing, network services, and network operations. You will also learn about wireless networking, network security, and networking in the cloud. Finally, you will learn about network troubleshooting, including command line tools and common cabling issues. Once you have completed this computer based training course, you will be fully capable of preparing for the CompTIA Network+ N10-006 Certification Exam. Working files are included, allowing you to follow along with the author throughout the lessons.